« A Right To Die? As we approach the significant date of the passing of the 1967 Abortion Act on the 28th April, this article by Heidi Miller brings home the significance of what we are marking. Let us never forget all of the babies killed by abortion all over the world. Just how far-reaching is the impact of abortion on our population and on the world? Yes, you may have read the statistics. You may have read the estimates. But that one big number is hard to break down into something tangible, something you can really grasp. Do you really want to understand the impact of abortion on a day-by-day, minute-by-minute level? I came across an eye-opening website on the world’s population. It’s a clock. The clock tracks many things, one of which is death. It breaks death down into multiple groups. The noncommunicable diseases – cardiovascular diseases, cancer, and respiratory diseases – take many lives. Also reported are death by injury and death by communicable diseases. You can watch the death count rise for each of the categories listed. But there in the lower right-hand corner is the count for abortions. I found myself staring at this number, watching the number rise right before my very eyes. Watching the count increase one number at a time and thinking that each number represents an individual child was sobering. You can view the rise of the estimated amount of abortions for the year, for the month, for the week, or for the day. Or you can zero everything out and watch all the statistics start from zero. The first death added to the display will be in the abortion category. 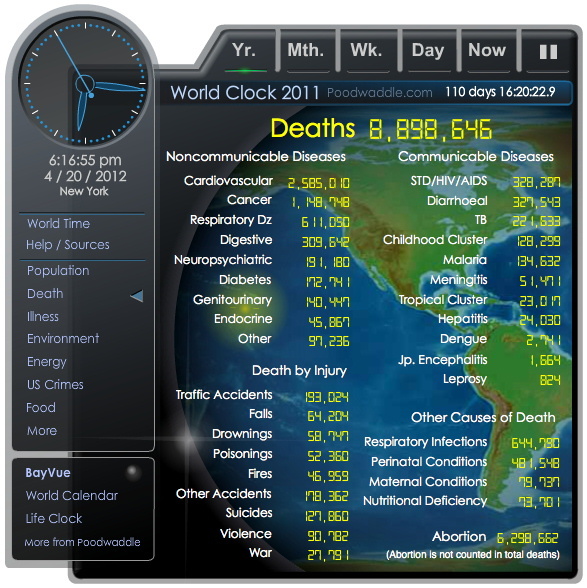 The clock doesn’t include the count of abortions when reporting the total number of deaths in the world. 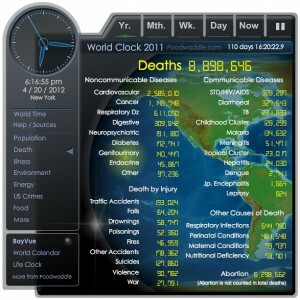 At the time of writing this, the estimated number of deaths in the world to date for 2012 was 8,898,646. The total number of abortions (not included in the previous number) was 6,298.662. Add these two numbers together for a total of 15,197,308. This means that abortion accounts for approximately 41% of deaths worldwide according to the statistics used by World Clock. The clock also has a pause button. It’s nice to hit pause. But it just stops the count on your computer; it doesn’t stop what is happening out in the world. We need to find a way to not only use the pause button on abortion in our world – we also need to use the stop button. I would encourage you to go over to the World Clock website. In the left-hand column, select “death” as the information to be displayed. Then sit there and watch. Realize that each number added within the display represents an individual person who died. Maybe someone died of malaria, maybe diabetes, maybe from a traffic accident, or maybe they died from an abortion.